The location is amazing. Walking distance from the women’s entrance. Also great restaurants nearby. For me, staying with your wife at Anwar Al-Madinah Movenpick is a major sign of the love you have for her. It has everything a family needs in terms of comfort and proximity to the Holy Haram. Location was very near to Haram with Womens entrance. Service provided by hotel staff was awesome, quality of service as well as room quality was 10 on 10, it was perfect. I recently got married and had very momerable moments here, they have made every arrangements special for me. 25/7 shuttle service to Haram. This is the best part of your services. Location is close to Haram. Check out was very quick and handy. This was my third visit for the hotel. I had very good experience for the first two. However, this time the I felt the staff was not understanding , the room we booked included sitting area and sofa, but the one we received did not have a sofa and was very tight. The towels in the bathroom were outdated. Anwar Al Madinah Mövenpick This rating is a reflection of how the property compares to the industry standard when it comes to price, facilities and services available. It's based on a self-evaluation by the property. Use this rating to help choose your stay! One of our top picks in Medina.The 5-star Anwar Al Madinah Mövenpick offers elegant accommodations less than 5 minutes’ walk from The Mosque of the Prophet Mohammad. It features 4 on-site restaurants. Free WiFi is available in all rooms. 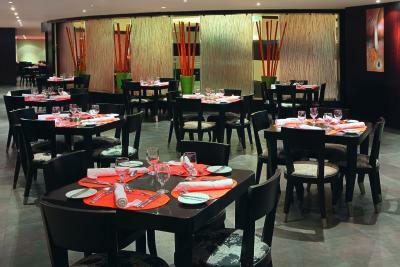 The elegant air-conditioned rooms at Anwar Al Madinah are spacious and modern. Each comes with a refrigerator, a work desk and satellite TV, as well as an private bathroom. In a prime location in the heart of the Madinah shopping district, Hotel Anwar Al Madinah is connected to a shopping center. It is also just 2.5 mi from Mount Uhudh and 1.9 mi from the Madinah Dates Market. 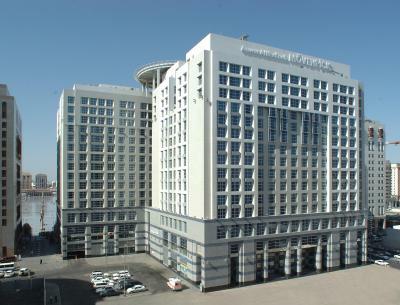 Anwar Al Madinah Mövenpick provides laundry and dry cleaning services. It is 9.9 mi from Prince Mohammed Bin Abdullaziz International Airport. Featuring a partial Haram view, this air-conditioned room offers a flat-screen TV, a mini-bar and an private bathroom with a shower. Please note that king size bed will be subject to the hotel availability upon check-in with top priority. Private parking is available on site (reservation is not possible) and costs SAR 5 per hour. 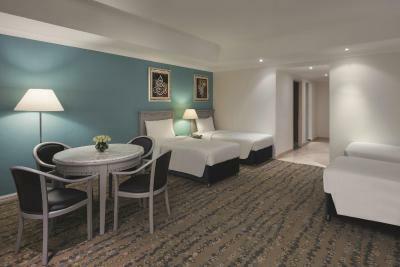 Located in the Haram Tower, this room offer city views of Madinah, a mini fridge, LCD TV and free WiFi. It includes an private bathroom with a shower. Featuring a partial Haram view, this air-conditioned room offers a flat-screen TV, a mini-bar and an private bathroom with a shower. 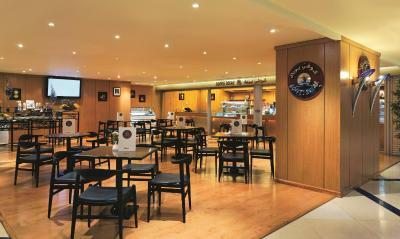 It also offer Executive Lounge access, free WiFi, a mini fridge and complimentary hot drinks. With wonderful views of the Holy Haram, our Royal Suite is Spread over a huge space of 528 sqm, this air-conditioned suite offers a large, fully equipped kitchen, spacious dining area for 16 guests, an office, safe and complimentary WiFi Internet. Free access to the Executive Lounge is included. There are four bedrooms, each with its own 36-inch flat screen LCD TV which allows you to view over 80 channels. The living room and master bedroom, which has a king-size bed, offer beautiful views of Masjid Al Nabawi. Twin beds are provided in the other three bedrooms. Inside the bathroom is a jacuzzi, high quality bath and shower products, plush bathrobes and slippers. There is also an additional maid’s room with bath. Executive Lounge access includes snacks, variety of hot and cold drinks, seasonal fruit, dedicated business center, Wifi access, TV, kids area, butler service. Featuring a Haram view, this spacious, air-conditioned suite offers a living room complete with a dining area. It offers a flat-screen TV, a mini-bar and an private bathroom. 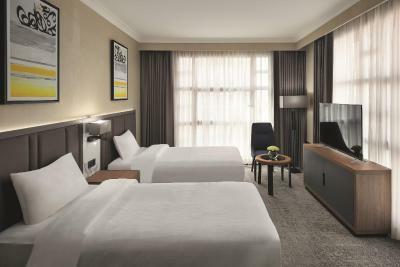 Featuring free WiFi, this air-conditioned room offers a city or courtyard view. It features a flat-screen TV, a mini-bar and an private bathroom. It includes free Executive Lounge access. Featuring free WiFi, this air-conditioned suite offers a partial Haram view. It features a flat-screen TV, a mini-bar and an private bathroom. It includes free Executive Lounge access. Featuring free WiFi, this air-conditioned room offers a Haram view. It features a flat-screen TV, a mini-bar and an private bathroom. It includes free Executive Lounge access. 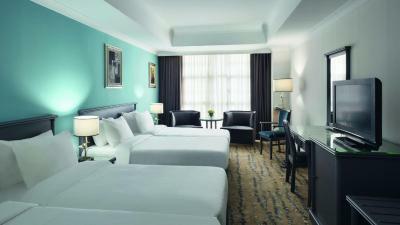 Featuring a Haram view, this air-conditioned room offers free WiFi, a flat-screen TV and a mini-bar. A shower is fitted in the bathroom. This air-conditioned room offers a flat-screen TV, a mini-bar and an private bathroom. These rooms are located in Madinah Tower and view is city or courtyard. Ambassador Suite features a fully equipped kitchen, three bedrooms and maid’s quarters. Enjoy views of the city and courtyard, Executive Lounge access and free WiFi. 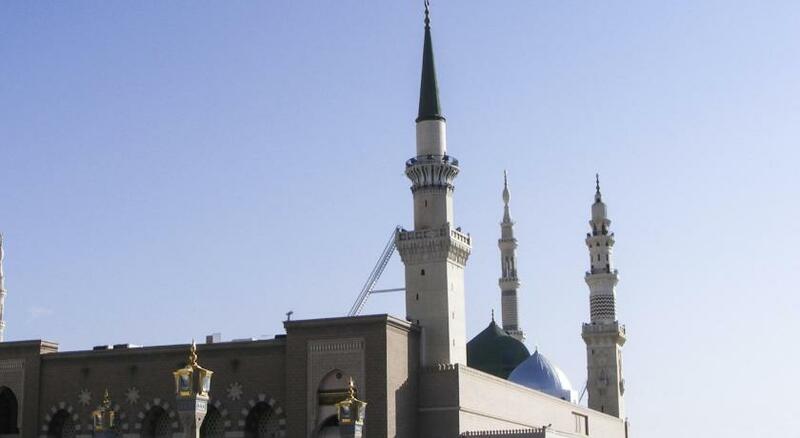 The hotel is located close to Masjid Al Nabawi in the central zone of the commercial district. It is the nearest hotel to the Ladies Prayer Entrance. House Rules Anwar Al Madinah Mövenpick takes special requests – add in the next step! Anwar Al Madinah Mövenpick accepts these cards and reserves the right to temporarily hold an amount prior to arrival. Please note that all children are welcome. Up to two further children under 12 years stay free of charge when using existing beds. Children from 6 up to 12 years old will be charged at 50% of breakfast price. 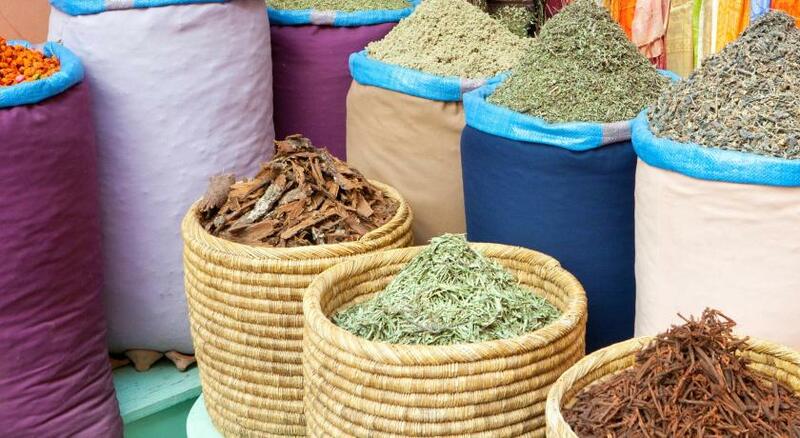 Kindly note that during the Holy month of Ramadan from 06 May 2019 until 4 June 2019 - Sahur will be served instead of normal breakfast and if requested Iftar Ramadan will be at different price.